Add Big Lots to your favorites! 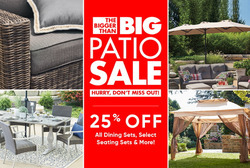 25% off all Dining Sets, select Seating Sets & more! Interesting Treat Mom to a Special Mother's Day! Add Aldi to your favorites! Add Dollar Tree to your favorites! Add Walmart to your favorites! Free Shipping Introducing FREE 2-Day Shipping at Walmart.com! Add Kmart to your favorites! As a Fortune 500 company with stores in 48 states, Big Lots is an extremely successful retailer of discounted merchandise. Big Lots is a department store that has a huge selection of different types of merchandise. A lot of their products are particularly inexpensive because they sell items that have been overstocked or closed out. THey also have regular items that are regularly in stock. Their secret for being so successful? The great prices! Big Lots sells everything you need: furniture, clothing, housewares, kitchenware, small electronics, drinks, and toys. The awesome thing about Big Lots is they have tons of programs in place to sell their merchandise at super low prices. A weekly ad is printed, “This week’s deals” are found online, and you can sign up for even more savings through the Buzz Club Rewards. All of this information can be found right here, so have a look around to start shopping at Big Lots today. Sol Shenk started the Consolidated Stores Coporation in 1967, which today has become Big Lots. The first store opened by the coporation was called Odd Lots and opened in 1983 in Ohio. Slowly, it started expanding - and they haven't stopped since! Today, there are around 1,500 Big Lots store in the United States and they employ somewhere around 11,4000 people. Two short-lived forms of Big Lots include Big Lots Wholesle (which sold products in bulk qualities for people interested in reselling them), and Big Lots Canada. Big Lots Wholesale shut down in 2013, and Big Lots Canada in 2014. Boots, Hippo, Porkchop and Tabitha used to star in the Big Lots’ famous ads. Do the names Boots, Hippo, Porkchop, and Tabitha sound familiar? They’re the stars of one of the most famous series of television ads in recent years! There is one small detail about these stars though – they’re all animals. The characters are part of a campaign called “Pets Focus Group” that featured focus groups of animals having discussions about the quality of products made just for them. The videos feature people asking silly questions and video footage of actual responses from the pets, like a funny expression from a dog or a cat casually ignoring everything that’s going on. The ads were a huge hit with viewers. After all, lots of you have probably wondered what your pets would have to say about the things you buy for them, like their food or toys. Do you want to receive more deals from Big Lots by email?